This is a Sunday school lesson about the second greatest commandment to love your neighbor as yourself. The lesson will have children reading aloud several verses which command us to love our neighbors. 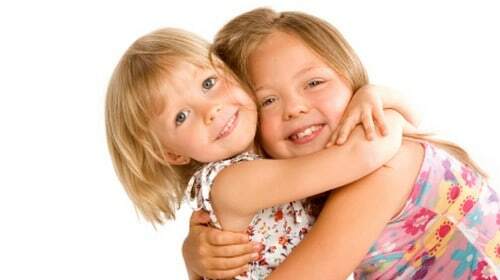 The children will discuss who their neighbors are and how they can show love to them. Learning Objective: The children will learn who their neighbors are and how to show love to them. You could also use this “Love Your Neighbor” coloring page if you class has more younger children. “What is a neighbor?” Children give various answers. “When we say we live in a neighborhood, what does that mean?” Children give various answers. “How does God want us to treat our neighbors?” Children give various answers. Choose six volunteers to read out loud. Pass out one reference card to each volunteer. References to be included on the cards and read out loud are: Mark 12:28-34, Leviticus 19:18, Matthew 7:12, Matthew 19:19, Matthew 22:36-40, Romans 13:8-10 and Galatians 5:14. Each volunteer takes a turn reading aloud their assigned verses. “There are a lot of verses about loving our neighbor. With so many verses in the bible about this, I know loving our neighbors is important to God. How does He say we should love them?” Children answer. “God wants us to love our neighbors like we love our self. What do you think God means by that?” Children answer. Pass out the prepared Do You Love Your Neighbor worksheet to each child. Give the children time to think and write. “Thinking about the name of the person you wrote down, what are some ways you can show them love?” Have children share the name of the person they wrote down and brainstorm with them ways they can show love to this “neighbor”. If you have a large group you may want to have them brainstorm with a partner or in a small group first before sharing with the whole group. Next, have the children write down one way they can show love to their chosen family member inside the same “immediate family” circle. 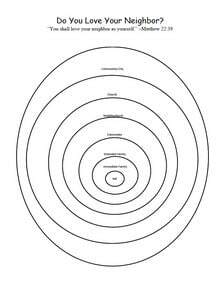 Follow steps 3-6 for the remaining circles: extended family, neighborhood, classmates, church, and community/city. Have the children take their worksheet home to display in their room as a reminder of their commitment to love their neighbor as their self. This worksheet will remind them of specific and practical ideas for how they can live out the second greatest commandment. Thank you so much for your good materials. it is very useful for us. I have been looking for a site to help with lesson preparation. Found your site and I am loving it. Thank you so much. God bless. We’re in Alabama. exactly what i have been looking for – thank you! Thank you for this great lesson and permission to copy. I’m new at teaching children so this is wonderful. May God continue to bless your ministry and families! Thank you so much for these lessons. I use them almost every week to facilitate a teaching plan that is interactive, easy for the kids to understand and coincides with scripture. I absolutely love it! We are in St. Croix, U.S.V.I. Thanks so much! This is perfect for my February love kid’s church!! Tony Kummer (Editor) reviewed & updated this page on : March 1, 2019 at 12:50 pm. All our content is peer reviewed by our readers, simply leave a comment on any post suggest an update.